Bridges can be very helpful when resolving a cosmetic issue in the mouth. One way to take care of a gap caused by a missing tooth is with a dental bridge. A dental bridge is called a bridge because it literally bridges the gap where one or more teeth used to be. Bridges are cemented to the teeth adjacent to the empty space. The adjacent teeth serve as the anchors for the bridge. The adjacent teeth are trimmed down and capped with a crown, and then a replacement tooth is attached to those crowns to form the bridge. This single, fixed unit is securely cemented to your teeth and your smile and ability to chew food is improved. There are several types of dental bridges. Each bridge is made with different materials and is better suited for certain areas of the mouth and for certain types of situations. After your consultation, we will recommend the best type of dental bridge based on your individual circumstance. These are the most common dental bridges. These bridges involve creating a crown for the tooth/teeth on either side of the missing tooth in order to support a replacement tooth in between. Traditional bridges are made of either porcelain fused to metal or ceramic. These bridges are used when the replacement tooth can only be supported from one side (a single tooth only). 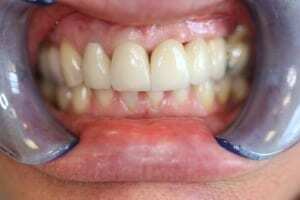 A cantilever dental bridge is typically used when the space is small and the stresses will be minimal. At your consultation appointment we will discuss the indications for this type of dental bridge depending on the clinical situation and health of the adjacent supporting tooth. This dental bridge is most commonly used to bridge front teeth together. The Maryland bridge technique, uses metal or resin “wings” on each side of the bridge that are cemented to the existing, adjacent teeth. One of its big advantages is that it requires very little shaping, if any, of the anchor teeth. These bridges are recommended if you’re missing more than one tooth. This technique involves the placement of two or more dental implants with space between them. These implants serve as the anchors for the permanently cemented bridgework. Because dental implants simulate tooth roots, they maintain the integrity of the jaw bone and provide a solid support for the replacement teeth. As with crowns, bridges are made of several different types of materials. Material selection is based on your existing teeth, the area of the mouth to be where tooth/teeth need to be replaced and the type of bridge to be used.